Koei Tecmo and Omega Force return with the latest installment of their Dynasty Warriors franchise, Dynasty Warriors Empires 8! Conquer Ancient China your way through strategy and relive the battles of the Three Kingdoms in this fast-paced historical fantasy. Like its predecessors, Dynasty Warriors 8 Empires is based on the “Romance of the Three Kingdoms.” The factions of the Wei, Shu, and Wu wage war against each other for supremacy over feudal China. Playing through the stories of each individual character contributes to the game’s history and it also provides hypothetical scenarios depending on the success of the kingdom of your choice. The game is divided into two modes, Empire Mode and Free Mode. In Empire Mode, players are given the option to choose which side to pledge their loyalty as an officer or raise a banner of their own empire as their own character. Free Mode allows players to play through a series of stages earned while advancing through characters’ individual stories. These stages provide the opportunity to strengthen weaker characters. Free Mode may also trigger unique interactions for select characters not seen in Empire Mode. Dynasty Warriors 8 Empires lives up to its franchise name by returning with the classic one-man army combat style. Players gain the satisfaction of devastating their foes by unleashing powerful Musou attacks. However, there have been a few changes to the battle system. This installment focuses more on strategy which offers a more tactical approach compared to the usual “hack and slash” solution. This refined strategic system offers a more grueling challenge for players when enemies invade their territory by defending against pincer attacks and sabotage. Another change is the removal of the special element attacks. Trademark techniques such as “Blizzard” and “Fire” have been replaced by “stratagems” which are battle cards marked with a fee to deploy it in combat. The fees can be repaid by vanquishing your opponents compared to the old cool-down periods of the special attacks. Stratagems do make a name of their own by varying from elements, turrets, healing, and even razing a whole base to the ground! An example of deploying stratagems. DW Empires 8 holds onto the dual weapon system from DW 7 along with the ability to summon your loyal steed in DW 8. In the game’s “Edit Mode,” you’re free to create your own officer right down to the voice and weapon of choice. One of many customizable options in Edit Mode. Players can even enjoy this game with a friend online for a collaborative experience to take on missions too difficult to do alone! Marriage also returns in DW 8 Empires which allows you to pair your favorite officer (or your own character in the Gathering of Heroes story) with your dream officer. Your relationship with your fellow comrades ranks from E to A, but to raise your friendship levels, you must interact with your ideal partner, prove your skill in war, or appeal to their requests. Once your relationship is maxed, you may confess to your partner, but sometimes your partner will confess to you! Tecmo Koei brings romance in the Romance of the Three Kingdoms. 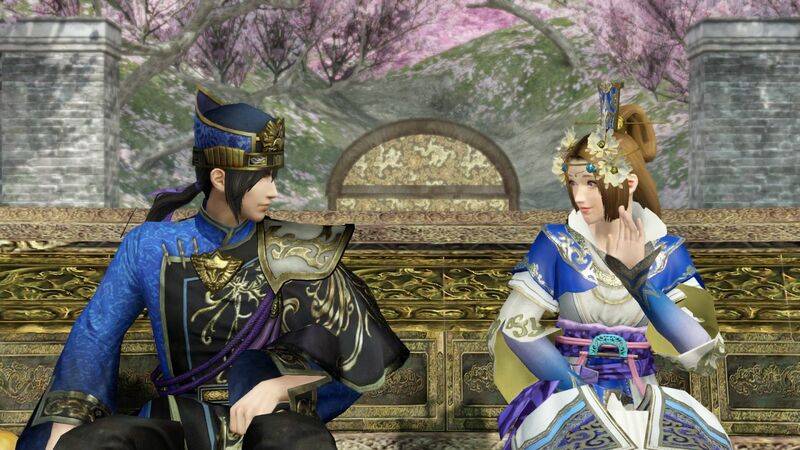 In the other Dynasty Warriors games, once a confession happens between two officers, it’s just a few words of encouragement than a text stating that the officer who praised you is your spouse. This game changes the “romance” into something much more meaningful by providing a cut-scene of not only the confession but the wedding ceremony as well. You can even start a family with your spouse! The offspring system is a tad limited in regards to the fighting skills your child will inherit and its appearance. The child inherits the parents’ stats and the prowess of your officer. The concept of having a child is an interesting notion, but it still requires work. One of the inconsistencies of having a child in this game is the age of the parent and offspring. By the time your offspring joins your army he or she is an adult, but your character and spouse didn’t age a day! The only way this concept would make sense to me is the time travel method used in Fire Emblem Awakening. The child’s appearance is also an issue. Once your child arrives to battle they will have a preset form. This is appealing in a sense, but once in a while through your ventures, your next child’s randomized appearance could be a senior citizen. Unfortunately, you are stuck with your child’s current state until you have completed Empire Mode. I’m willing to give this feature the benefit of the doubt since it’s a new addition to the game. As far as graphics go, Tecmo Koei always strives to improve their eye-catching characters with each new installment. There is a significant difference between the PlayStation 3 and PlayStation 4’s graphics, but the gameplay is the same. To the left PS3 graphics and to the right PS4. Just a few minor differences. 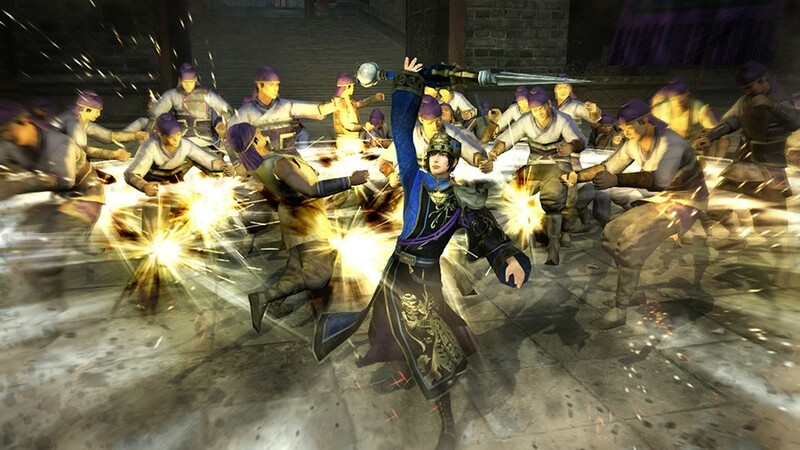 Dynasty Warriors 8 Empires like the games that came before can be a tad repetitive, especially once your character is strong enough to dominate the field of battle alone, but that doesn’t mean the game isn’t worth playing. Each character has their own story that ties into theoretical scenarios of what could’ve happened during the war. I’m impressed by the number of options given to players when it comes to creating their officer. Tecmo Koei even allows players to create the story their way through “custom scenarios” and Empire Mode. The improvement of the marriage system is definitely a plus, but the new offspring system will still need some work should the company pursue creating another Empires game. Overall, I give Dynasty Warriors 8 Empires a 7 out of 10. It’s not the best Dynasty Warriors game, but I see a lot of potential with this game. 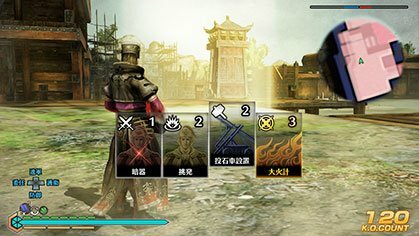 I’ve got my fingers crossed for the developers to make the next game something all that will blow all Dynasty Warriors fans away! Should you play the new Dynasty Warriors game? It’s definitely an enjoyable hack and slash if you’re into playing games involving characters battling against overwhelming odds!